In 1929, Jean Borotra was approached by Wallis Myers and Lord Lyle to form a Club in France in what the former described as an "extension of the British franchise." Mr. Borotra was the first Chairman of the French Club and participated actively right up until his death in 1994. He regarded tennis as a lifetime game and as a model for the young in demonstrating that it is possible to continue to play throughout a long life while carrying on a career outside lawn tennis. Other nations followed suit, the USA and Netherlands in 1931, Czechoslovakia in 1933, Sweden in 1937, and, following World War II, many more until now there are 34 I.C. 's around the world. Each Club organizes its own annual program to achieve the objectives set forth in the constitution. Matches are played between International Clubs which have, over the year, enabled international players to maintain their friendships achieved through tennis. Thus the I.C's have never become involved in the politics of lawn tennis and they represent an ideal arena in which lawn tennis can be played free from the politics of the world game and pressure from commercialism. 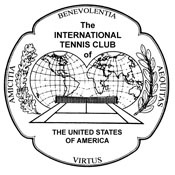 The Seal of the International Clubs was adopted in 1949. The outline of the seal is a silhouette of a tennis ball divided into four equal parts. These may be considered as North, South, East and West. In each section is placed a Latin Word. These four words symbolize the ideals of international tennis. At the top is the word BENEVOLENTIA which means "Goodwill." At the bottom, the foundation of the Seal, is built the word VIRTUS. This means "Valour, Courage and Bravery." In the left side is the word AMICITIA which means "Friendship." In connection with this word is the oakleaf, which is the symbol of strength, so it can be interpreted as strong friendships which are established through tennis. On the right side is the word AEQUITAS which means "Sportmanship." Placed next to this word is the laurel, which is the symbol of Victory, to associate the ideas of victory through sportmanship. In the center of the Seal are placed the Eastern and Western hemispheres which are joined under international tennis. On this are shown all the countries of the world. The tennis court, which is drawn as it is viewed by a tennis player, faces the design of the International Club will have, in opposition, players from all over the earth. The player, as he views the court, will see on the other side of the net, the two hemispheres which will symbolize competition in worldwide terms. The oakleaf design was made from an actual oakleaf picked from an oaktree in front of Longfellow's famous Wayside Inn. The laurel was made from drawings of early Roman designs.